Trends at times seem to come out of nowhere (probably because I am not as knowledgeable as I should be – I can admit that! ), and one that has shown up in the last few years is various yuzu – the rough-skinned lemon-looking citrus fruit popular in Asian countries – items in cocktails. However, I hadn’t really found a yuzu-based ingredient that felt made for cocktails. Until this summer, the summer of 2018! 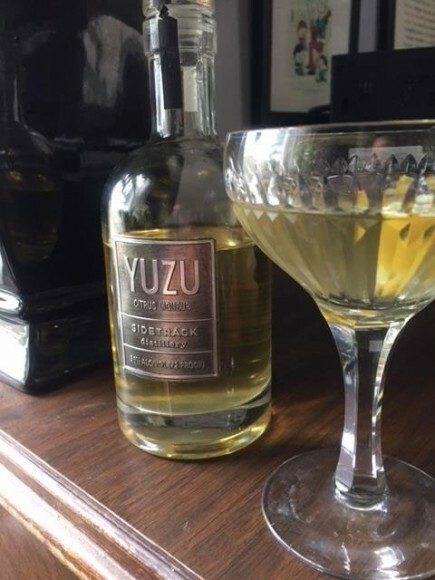 When Sidetrack Distillery (the wondrous spot on a farm right outside Kent, WA here in WA) unveiled their new Yuzu Liqueur. Now, I know how good all of the Sidetrack Liqueurs are, made using fruit, produce, and other items grown on the Lazy River Farm where the distillery resides. So, I had high hopes for their Yuzu – and it delivers. Citrus-y in a way that straddles lemon, grapefruit, and little mandarin orange, it has orchard aromas for days, and then a rich taste that trails off with a bit of kick, balancing the liqueur’s sweetness. Great stuff and made locally to boot– but what to do with it? Well, my first thought was a gin that has a whisper of citrus, and, you know what (I say humbly)? It was a very good thought. The gin I went for was Wildwood Spirits’ Kur gin, also made in wonderful W-A, with local wheat, jumping juniper, various other delights, and a bit of Seville oranges. Then, our drink didn’t need much more, just a hint of brightness and botanicals from some Dolin Blanc vermouth, and a little spice and some light undertones from another local, Scrappy’s Orange bitters. Altogether, a (as you’d guess from the title) delicious drink, one with a nice backbone and a full strata of delicate and more forward citrus and spice, a drink that’d be a fine pre-dinner, during-dinner, or post-dinner accompaniment. 2. Strain into a cocktail glass. Twist the twist over the glass and drop it in. Oh, be sure you’ve tasted that Yuzu liqueur on its own, too. Or you’ll be sorry. I’ve been wanting to name a drink “Snigginson van Pickyns” since like September 27, 2017. See, back then I had a Cocktail Talk quote from a F. Marion Crawford story called “The Upper Berth,” which was in (for me, at least) an Alfred Hitchcock collection called, Bar the Doors. Actually, it was the twenty-sixth day in said month when I had that post, but then I think it was the following day when I put got word on the social medea* from pals @stereolad and @PaulTobin that, really, a drink should be named Snigginson van Pickyns. And, and usual, they were right! But it’s taken a time to find the right drink. First, due to the quote (go read it, if you haven’t), said drink needed to be sherry-based. Then, it needed to be awesome, cause, well, it’s called Snigginson van Pickyns! That demands awesome. 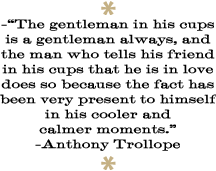 Luckily, not too long ago I received a little sample of Martini & Rossi Riserva Speciale Ambrato vermouth, a limited-time number celebrating the 150th Anniversary of the vermouth maker – and that was exactly what was needed for this drink. Made on a base of Moscato D’Asti and boasting an array of botanicals (cinchona bark, Chinese rhubarb, and other global-traveling, Snigginson van Pickyns-y things), it’s a well-balanced liquid one could drink solo, but its lovely floral nature underlined by a light sweetness, citrus, and ethereal herbs and spices goes neatly into certain cocktails, too. Good stuff. And an ideal match for sherry, especially the more delicate (perhaps) Fino sherry. But that wasn’t enough for Snigginson van Pickyns! 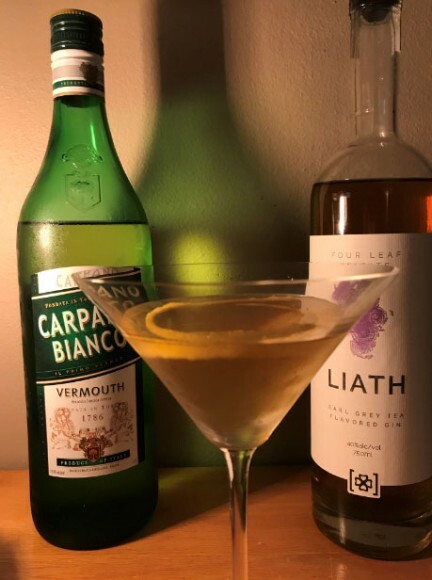 While the above two ingredients were an amazing start, something else was needed to round things off, and I kept it in the vermouth family – Dolin Blanc vermouth. Hopefully our two vermouth producers get along (hey, we’re all drinking, it’s fun, they should), because the double shot of vermouth with sherry is a match made in spring-and-summer-time drinker’s heaven. Lots of tantalizing and tactful flavor, but all graceful enough that it won’t weigh you down when sipping under the sun. A little lemon in twist form finishes everything off, and voila! A drink worthy of the name Snigginson van Pickyns. It only took about six months. 1. Fill a cocktail shaker or mixing glass halfway full with cracked ice. Add the sherry and the two vermouths (quick aside: Sherry & the Two Vermouths might be a good band name). Stir well. *If you’ve read/seen the Jean Anouilh play of the same name, you get this! Though maybe even if you’ve just ready the Euripides, you get it, too! Maigret had ordered a vermouth. He looked even taller and wider than ever in the confined space of the bar. He didn’t take his eyes off the Latvian. He was having something like double vision. Just as had happened to him in the hotel lobby, he could see one image superimposed on another: Behind the current scene, he had a vision of the squalid bar in Fecamp. Pietr was going double. 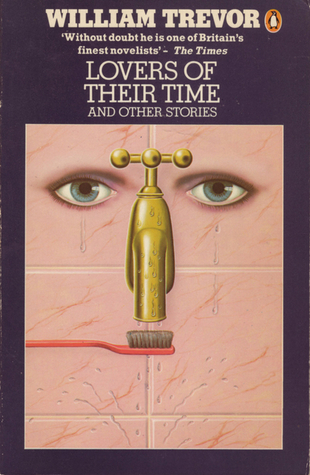 Maigret could see him in his cinnamon suite and in his worn-out raincoat at the same time. “I’m telling you I’d rather do that than get beaten up!” one of the builders exclaimed, banging his glass down on the counter. 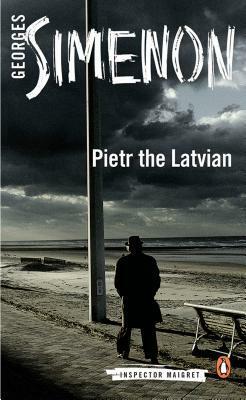 Pietr was now on his third glass of green liquid. Maigret could smell the aniseed in it. It’s interesting – we hear “leaves” and we think “fall,” because seasonally that’s when leaves become more iconic I suppose. Which may be backwards, since so many leaves are in place now, providing shade and such. And anyway, when titling this drink “Afternoon Leaves,” I was thinking more that it feels like such a nice drink for the end of the afternoon, the moment when afternoon itself is leaving to make room for dusk and evening. Whew, that almost got too sappy! Late afternoon is also when many have tea (those pals in the U.K. first and foremost perhaps), and that also ties into this drink, since one of the two ingredients is Four Leaf Spirits Liath, an Earl Grey tea-infused gin. Pretty neat! Four Leaf is a small (in square feet, but not in taste) distillery in Woodinville, WA that makes tea-infused spirits and liqueurs (and rums under the Puget Sound Rum Company moniker), and also donates a portion of proceeds to cancer research and education-focused non-profits. Drinking and doing good is, well, good! The Liath (named after the Irish for “grey”) is swell all on its own, with the juniper and botanicals from the gin mingling around the citrusy bergamot from the tea. But in the declining afternoon hours (which can be a little lonely), I wouldn’t want it to operate alone, and so picked a perfect partner: Italian vermouth legends Carpano’s Bianco vermouth. I just recently picked up a bottle of this elixir, and it’s a special tipple, starting from the citrus, fruit, and nutty nose to the light-but-full taste, which has the flavors promised to the nose, with a touch of white-wine mineral-ness. Delicious solo as well, when combined with the Liath you have a complex but so sip-able cocktail. Try it, in the afternoon of course. 1. Fill a mixing glass or cocktail shaker halfway full with cracked ice. Add our two charmers. Stir well. Okay, I can hear many groaning at me right now – listen, yucks, just chill out. I know that Ardbeg is a super delicious Scotch. And that tomorrow, May 28, is Ardbeg Day. That’s right – it’s such a dandy Scotch distillery that it has a day named after it. Be sure to celebrate. And perhaps the best way to celebrate is by trying, slowly and reverently, the new Ardberg Dark Cove. The darkest Ardbeg ever and one that’s only being released in a limited way (as they do on Ardbeg Day), Dark Cove takes its name from the smugglers who used to utilize the caves in the rocky hills near the Ardbeg distillery – and they weren’t using said cave for makeout spots (at least not too much). 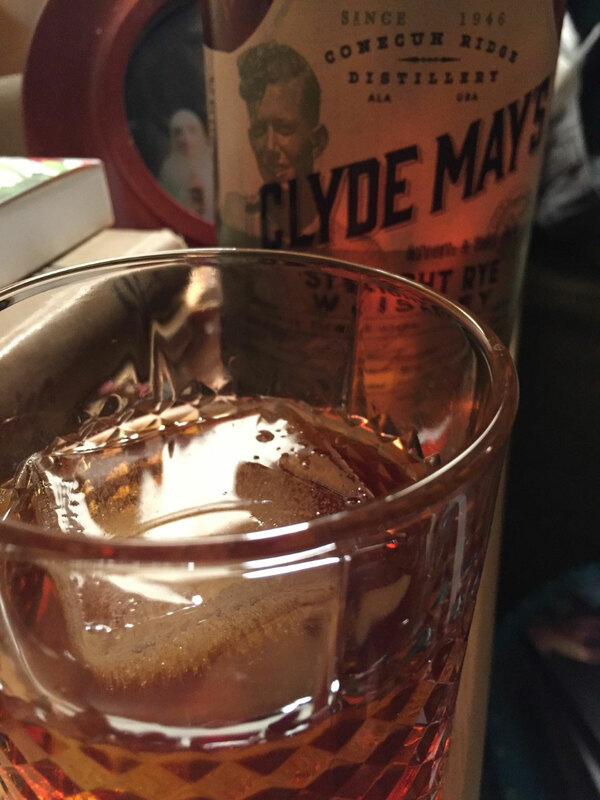 It gets its signature taste from maturing the whiskey in ex-bourbon casks, and the hearts in dark sherry casks. That’s right – two cask types! And that taste: a little raisin and date and spice up front, followed by charcoal and wood, and ending in a singular savory-ness and a little coffee and toffee. Good stuff indeed, and it goes on sale tomorrow (I got a little advance sample), so get some. But back to the groaning you’re gonna make. See, though you really should sip this solo, I couldn’t resist (this is how my mind works) using it in a cocktail. I wanted one that really let it shine, but then also had one or two other pals along, to see how it played with others. So, I went for the Thistle. An old cocktail, really a Scotch Manhattan of sorts, you often see this with equal parts sweet vermouth and Scotch. But in some old tomes, you see double the Scotch or other slightly different ratios. I’m going even farther here, to give the Dark Cove a little more space. 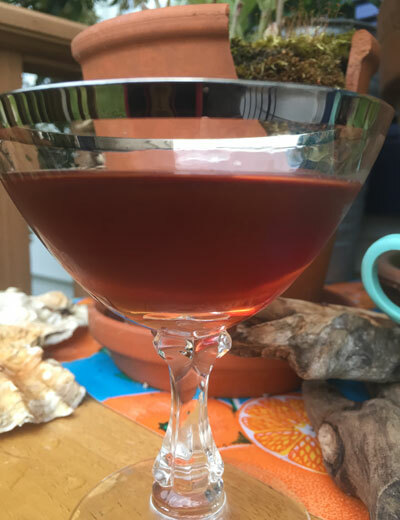 I’m also bringing in a serious sweet vermouth to play its role (the Banquo to the Scotch’s Macbeth, except not a ghost), Martini Gran Lusso Italian vermouth, 150th anniversary edition, based on a blend of Barbera and oak-aged Moscato. Amazing stuff. And this is an amazing. Try it, and stop your groaning. 1. Fill a cocktail shaker halfway full with cracked ice. Add it all, except the twist. PS: Yeah, this is very close to a Rob Roy. You can groan about that, too. While I’m having fun drinking. Don’t, I tell you, don’t take the name of this drink overly seriously – if you’re not finished by midnight, it’s not like you’ll turn into a gin-y pumpkin, or a lovely stepsister, or a candle nearly burnt out. But hey, sometimes the midnight oil doesn’t need to be completely burned out, right? And really, just start earlier! 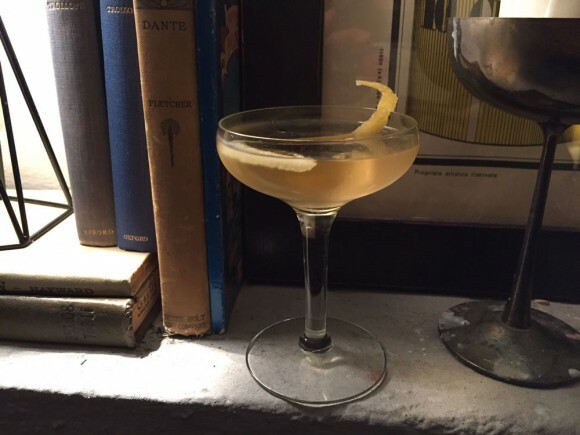 I started here with the new (if you haven’t seen my drink An Elusive Memory, and my write up on Boodles gin proper, don’t miss it. Don’t, I tell you) Boodles Mulberry Gin, which I’ve heard is the first mulberry gin to reach the shores of the U-S-A. More of a standard in Britain, mulberry gin (and of course sloe gin liqueur, a sort-of relative) is a UK standby, a little more light on its feet usually than you’d believe with some of the syrupy fruit liqueurs you may have grown up imbibing before you knew better. 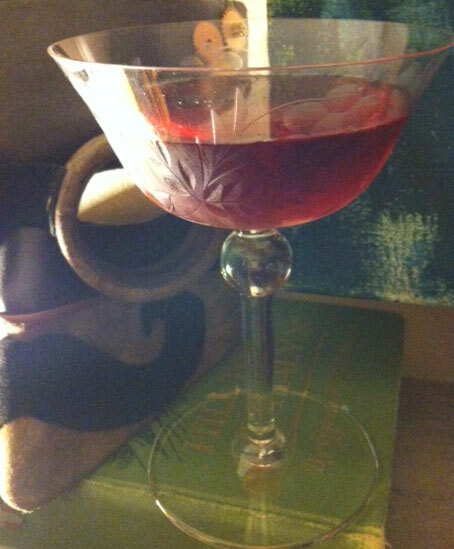 Here, the Boodles Mulberry is quite delicious, made with natural mulberries and other natural things, and the end result is more dry-ish than expected, but blooming with flavor, berries, currents, and the gin’s rich botanicals. It’s nice and complex, and worth sipping over an ice cube or two all by itself. But it makes a dandy cocktail ingredient, too. You don’t need too many dancing partners (or other ingredients). No need to weigh things down if you want to make it to midnight – or beyond. 1. Fill a cocktail shaker or mixing glass halfway full with ice cubes. Add the Mulberry gin, blanc vermouth, Pierre, and set the clock back an hour (haha, kidding). Stir well. 2. Strain into a cocktail glass. Garnish with twist – wide if you can.